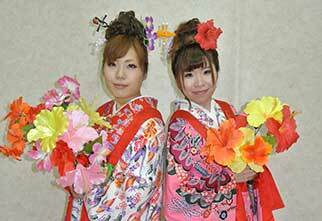 Try on Okinawa's traditional costume.Let us dress you up in Okinawa's traditional Kimono! Quick course and Traditional course. hair -set and kitsuke are included in the price. Photos will be taken with your own camera or sellphone with camera. 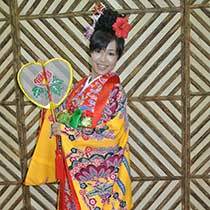 Try on both royal family's Bingata clothes and everyday clothes of common people with simple kitsuke way, and take pictures. 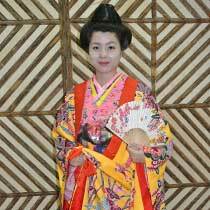 Try on Bingata Kimono with formal way of kitsuke. Step out of the studio! 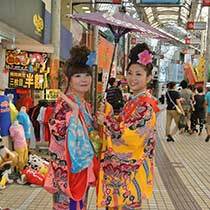 Walk around the city in Okinawa's traditional Kimono. 10 minute walk from monorail Makishi/Miebashi station. Located next to Hanagasa shokudo (花笠食堂) in Heiwa dori arcade. ※Please use nearby coin-operated parking. ・Chura Course: 15 minutes per person.